OPENING STATEMENTS WILL finally begin today in the long-awaited trial of James Holmes, the allegedly crazed gunman accused of opening fire in a packed Batman movie premiere in 2012, killing 12. Troubled graduate student Holmes, 27, has been in custody since the night of the mass murder in Aurora, Colorado on 20 July 2012, which also left 70 people injured. Holmes – who had a shock of orange hair when first seen after the attack, in which he allegedly dressed up as Batman villain the Joker – faces 166 counts of aggravated murder, attempted murder and possession of explosives charges. He has pleaded not guilty by reason of insanity, and much of the trial is expected to focus on whether Holmes was sane at the time of the massacre. A panel of 12 jurors and 12 alternates was selected after attorneys questioned over 1,000 of the 9,000 residents of Arapahoe County who received summons since January, when jury selection began. The trial is likely to hear some grisly and harrowing evidence. “Jury service is not something we do because it’s easy,” said Colorado District Judge Carlos Samour. It’s something we do because we deeply treasure our democracy. 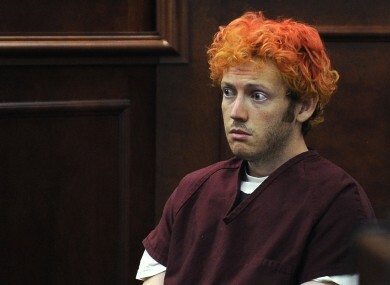 In preliminary hearings, prosecutors said Holmes had enough ammunition to kill everyone in the crowded theatre showing The Dark Knight Rises. His apartment was later found to be booby-trapped with an array of home-made explosive devices, which police had to disarm before entering the dwelling. Holmes appeared in court initially with flaming orange hair, apparently to mimic the Joker, who also had colored hair in the Batman movies. By the time he appeared at the start of jury selection, Holmes wore a sport coat, blue shirt and khaki pants, glasses and had his brown hair and beard neatly trimmed. Proceedings have dragged on for more than two-and-a- half years because the prosecutor is seeking the death penalty, according to Denver attorneys following the case. The defendant has undergone two psychiatric examinations. Holmes’s parents, Robert and Arlene Holmes, in December wrote a letter to the editor of The Denver Post saying their son had never harmed anyone prior to the shooting. “He is not a monster. He is a human being gripped by a severe mental illness,” the couple wrote of their son, who was a neuroscience graduate student at the University of Colorado School of Medicine before the shooting. If he is found not guilty by reason of insanity, Holmes will be confined to a state mental hospital. To win a release, he would have to be found free of mental illness and no longer a danger to himself or to others. Attorneys say that is not likely to happen, as no psychiatrist would be willing to sign off on releasing him. There is at least one famous precedent: John Hinckley, the man found not guilty by reason of insanity in the 1981 assassination attempt on President Ronald Reagan, who was back in court last week seeking to gain freedom. Hinckley has been in a Washington mental institution, but has lived with his mother in southeast Virginia 17 days a month since 2013. His doctors joined in Hinckley’s request that he be allowed out permanently with monitoring. Email “After years of delays, 'Batman' cinema shooting trial to get under way”. Feedback on “After years of delays, 'Batman' cinema shooting trial to get under way”.